in ALL caps: Katrina's anniversary is quiet.....too quiet. Katrina's anniversary is quiet.....too quiet. This is one where I will just unload on the ineptitude of the past administration under George Bush. Keep in mind, my opinions aren't necessarily those the others who write for this blog have, and I openly and candidly state that. 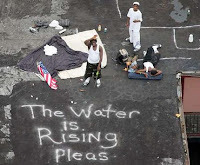 It's been four years now since Hurricane Katrina ravaged New Orleans and much of the gulf. The anniversary came and went without much fanfare. While I am not saying we should stop what we're doing 40 years after the event, the fact remains that New Orleans is still in rebuilding mode, and has a long way to go. From the blatant mishandling by FEMA's Michael Brown, to George Bush's vacation cut short to simply frown out of a window of a plane for a photo-op - many things could have been avoided, but they weren't. Click here for CNN's coverage of the anniversary. So, are we going to learn our lesson? We're approaching the middle of another pretty strong hurricane season, and the levees in New Orleans are still inadequate at best. The necessity for a city like New Orleans hails more back to the days of steamboats on the Mississippi, as it functioned as a trade port. Along with St. Louis, these two cities made up much of the commerce of the mid-west. The fact that the people of New Orleans - a city below sea level - has survived the beatings of countless hurricanes this long is a testament to the will of the people who call it home. That said, it's time that we understand what the future holds. Bush failed to recognize this. Sapping the economy of precious dollars that could have been used to fix and finish levees or boost our continually sagging education system in order to fight an illegal and immoral war in Iraq isn't the answer. The man simply cared about a purported legacy, and left the people of New Orleans to fend for themselves. I don't know about you, but this is why I want to remember this tragic natural disaster. To learn from it and understand the consequences of your actions. Especially if you're the president. Two songs today. One is one I made using samples from a radio interview with New Orleans' mayor Ray Nagin not long after the hurricane hit back in '05. The other? Well, it's a bit unintentionally related. Former North Carolina band Archers of Loaf created one of my favorite songs, a song entitled "Chumming The Ocean". If you would like to donate, please check out the ratings for one of the many local New Orleans not-for-profits here. Charity Navigator will help steer you in the direction of a not-for-profit where you know your dollars will make a difference. And buy stuff! For real! More Johnny Cash.....but not for the purists!